Rising Chinese smartphone giant Oppo has developed smartphone camera with a massive 10-times optical zoom. The company showcased the cutting-edge tech at an event in Barcelona this weekend ahead of the Mobile World Congress where telcos and device makers gather each year to talk about the future of mobile technology. While most smartphones rely on some kind of software-assisted digital zoom to take far-reaching shots, digital zoom is the ugly cousin of optical zoom because you can't just enhance the zoom in an image and expect to see new detail that wasn't originally captured. Most phones can handle 2 x optical zoom before digital algorithms are required to go further. So Oppo's 10 x optical zoom where the zoom is handled by device hardware is well beyond the capabilities of competing handsets currently on the market. For comparison, the latest iPhone XS can achieve 2x optical zoom, and then a 6x digital zoom on top of that. The Google Pixel 3 which has what many regard as the best camera on a smartphone thanks to some nifty software, uses its Super Res Zoom technology to achieve an outcome on par with a 2x optical zoom. To achieve its impressive 10x optical zoom, Oppo has built an 8.6mm triple-camera system that includes a 48MP main lens and a 120-degree ultra-wide lens and a 160mm telephoto zoom lens. To provide further improvement, OPPO also introduced Optical Image Stabilisation (OIS) on both the main camera and the telephoto lens to achieve higher, anti-shake accuracy, the company said. Oppo was keen to show off examples of its super zoom tech. The images it shared look mighty impressive but we're yet to get our hands on a prototype device to see for ourselves. Camera technology is always a major focus for smartphone makers, but perhaps more than any other manufacturer, Oppo has consistently made camera tech the focus of its devices and subsequent marketing. Two years ago at Mobile World Congress, the company showcased a smartphone camera that had five times zoom capability - a feat which it has now doubled. At the time, the tech wasn't integrated into ones of its ready-for-market smartphones and that is the case again this year, with the new capability to be included in the company's upcoming premium handsets. 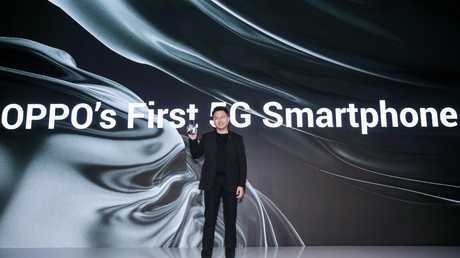 While Oppo didn't bring a new phone to this year's event, it was keen to tout its progress in 5G, and has been working with Australian carriers Telstra and Optus to have a 5G ready phone in the second quarter of the year. "OPPO has been anticipating and preparing for the arrival of 5G since 2015 and has invested in design and technology to ensure the production of a desirable smartphone, that doesn't compromise on functionality to accommodate 5G features and benefits," said Michael Tran, Managing Director at OPPO Australia. Anyi Jiang, vice-president at Oppo.